Facebook says images are removed from its servers immediately. "It's imperative to view privacy as a design constraint, not a legal add-on." But a Facebook spokesman defended the company's approach saying; "When a user deletes a photograph from Facebook it is removed from our servers immediately. "However, URLs to photographs may continue to exist on the Content Delivery Network (CDN) after users delete them from Facebook, until they are overwritten. "Overwriting usually happens after a short period of time." 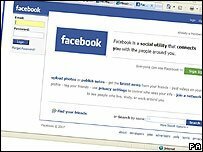 Users of Facebook staged a revolt recently over rules which would have given the site permanent ownership of their data.